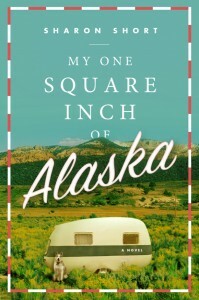 Sharon Short is the author of My One Square Inch of Alaska (Penguin Plume, 2013), a novel set in the 1950s that tells the tale of Donna and Will Lane, siblings who, along with Trusty, a Siberian Husky, escape their Ohio hometown and travel to Alaska. Short’s book Sanity Check: A Collection of Columns includes 100 reader-favorites of her weekly humor and lifestyle column that ran in the Dayton Daily News from 2002-2012. Short has also published two mystery series (Josie Toadfern and Patricia Delaney). 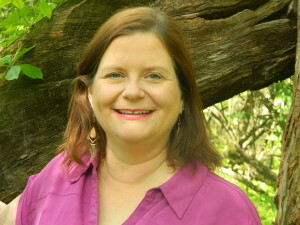 She serves as the Literary Life columnist for the Dayton Daily News, directs the renowned Antioch Writers’ Workshop in Yellow Springs, Ohio, and is an adjunct instructor of creative writing and composition at Antioch University Midwest. I had the pleasure of meeting her at the most recent Virginia Festival of the Book in Charlottesville. HUERGO: What sparks for you the urge to write? SHORT: I’ve been writing since I was a young girl, literally since I was about six years old. When I was about 6, I put together a little book called “The Fireman,” about, well, a fireman, who rescues a little girl’s cat. I gave it a red construction paper cover, and the price of one penny (writing “1 cent” in the upper right corner of the cover), and proclaimed it, on the inside front cover, to be published by “Little Golden Books.” Ah, the innocent belief of a small child. I then promptly sold it to my aunt. Ta da! Full print run of first self-published book, sold out, in one afternoon! So I’ve always had the urge to write. My first stories and novels were based on ideas that I looked for and knew I wanted to write. I knew I had to have something to write about. So I spent a lot of time asking what if about situations, and found some ideas that way. But now, for specific projects, I find that I now need for an idea to grab me by the throat, shake me about, and essentially say “I’m not letting go until you write me!” I just can’t get excited about an idea unless it grabs me that way. Maybe the “what if?” question has just so thoroughly embedded itself into my subconscious that I’m just not aware that it’s still operational, and it only seems as though ideas are pouncing on me in this way. In any case, the basic idea for My One Square Inch of Alaska came to me in this way and just would not let me go. A stray comment about “deeds to one square inches of Alaska, that used to come in cereal boxes…” grabbed me. The very notion of one tiny square inch in such a vast territory and what that symbolized took my breath away. Then the shadowy image of a young woman and her little brother came into my imagination, and I thought I could hear her saying, “tell our story of our one square inch of Alaska,” and that was that. I could not shake the image or the concept, and so I began brainstorming away until I had a draft, or at least part of a draft. SHORT: I feverishly write part of a draft, and then have to loop back and revise that before writing more draft material. I lurch ahead with that, then loop back and revise again, then plunge a little further along. By the time I’m at the final third, I really know my story, and I write the end very quickly. At that point I have a full draft, but I wouldn’t call it a first draft per se. The opening 50 pages or so have already been revised five or six times, the next 50 pages four or five times, and so on. But then I go through the manuscript very carefully and revise the whole thing two or three more times before giving it a final proofing. Well, final for me. That just means the manuscript is now ready for eyes other than mine. HUERGO: Have you ever found yourself stuck at some point in your writing? SHORT: I don’t seem to get stuck, unless I try to follow an idea that seems initially right for all the wrong reasons—this will be easy to write, this will sell quickly, etc. The middle of a piece tends to go slowly for me, though. The initial rush of excitement has passed and the end is not yet in sight, and the middle is where all those self-doubting questions come up: is this good enough? Does it make sense? That’s when it’s helpful to remember that this idea grabbed me by the throat and isn’t going to let me out of its clutches until I’ve done my best by it. SHORT: Several! I had a chaotic childhood, but was fortunate to attend a fantastic public school system. English teachers encouraged me to write and read all through elementary, middle, and high school, and that really helped me both on a personal level and as a writer. That confirmation and non-patronizing acceptance made a huge difference to my confidence as a young person and as a writer. In fact, I’d say Mr. Cahill in My One Square Inch of Alaska is a compilation of several teachers who were pragmatically nurturing in the same way that he is to Donna, my protagonist, a girl who dreams of being a fashion designer. SHORT: I tend not to talk too much about what I’m writing next because then I find that my urge to tell the story diminishes. I will say I’m at work on another literary novel, also set in mid-20th century America, and that, yes, it’s an idea that’s grabbed me by the throat. I also have several story ideas that have done the same thing. 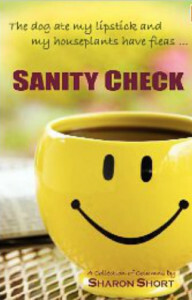 I was a lifestyle columnist—writing, essentially, mini personal essays—for more than a decade for the Dayton Daily News, and I’m excited that the audio version of Sanity Check (a collection of 100 of those columns) will be out in a few weeks. This entry was posted in Interviews with Poets & Writers and tagged Antioch University Midwest, Antioch Writers' Workshop, Dayton Daily News, Josie Toadfern, Patricia Delaney, Sanity Check: A Collection of Columns, Virginia Festival of the Book on July 29, 2013 by ehuergo.